Saffron was originally cultivated in or around Greece. Saffron is a spice derived from the flower of crocus sativus and is mainly used as a seasoning and coloring agent in food. It is dark orange and threadlike in appearance, with a spicy flavor and pungent odor. Saffron is the world’s most expensive spice. One of the reasons that saffron is so expensive is that its production is very labor-intensive. Saffron has a unique aromatic flavor difficult to compare to anything else. As a spice, saffron is known for what it does to energize dishes with a pungent, earthy essence. Saffron reminds you of eastern colors, perfumes and treasures. In other words, it is beautiful, tasty and expensive. Saffron is a powerfully flavored herb used in gourmet dishes. It’s commonly used in Spanish paella dishes, as well as Portuguese and Turkish cooking. 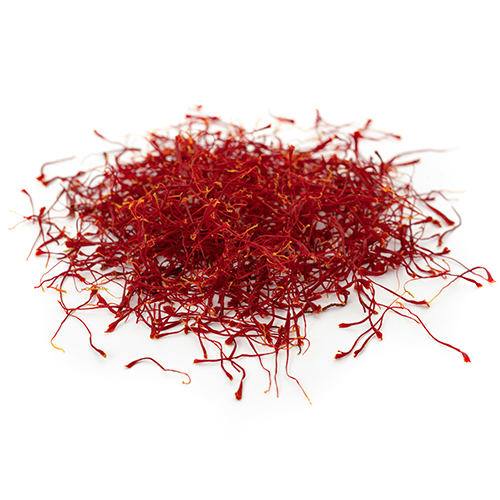 This exotic spice is often used in rice dishes (pilaf, paella, risotto) as well as many Iranian sweets as a great deal of saffron is grown and picked in Iran. A little bit of saffron goes a long way, it’s very intense. Just a pinch of saffron is all you need. Saffron pairs well with these spices: almonds, cardamom, cinnamon, cloves, coriander, cumin, mint, nutmeg, and complements recipes featuring: chicken, couscous, curries, flan, lamb, nuts, polentas, puddings, rice, shellfish, and soups. Saffron is so expensive because it takes many resources (water, fertilizer, land, time, labor) to grow a single crocus flower that will yield only three stamens of saffron that must be harvested by hand and can only be harvested during a period of 1-2 weeks each year. The flower can only be cultivated in certain climates with certain weather conditions and sunlight exposure. Saffron cultivation and harvest is still performed as it was since ancient times: by hand.